Every year since the U.S. Soccer Development Academy was founded in 2007, the beginning of June marks an early start to the Holiday season for 64 Boys' Development Academy teams. Before teams can dream about adding their name to the prestigious list of past academy champions, they must first qualify for the Academy Playoff Draw. The two oldest age groups of the Boys' Academy are eligible for the Playoff Draw: U-16/17 and U-18/19. At the younger age groups of the Academy, the focus is on individual player development, and there are no playoffs; only showcase events. As players move up the player pathway and into the older age groups, competing and learning to win become more important aspects of the player development process. At U-16/17 and U-18/19, standings are kept to determine what teams qualify for the Academy Playoff Draw. Thirty-two teams make up the pools for the U-16/17 and U-18/19 Playoff Draws. At those age groups, the 82 Academy programs are broken up into seven divisions, based on geographic location: Northwest, Southwest, Mid-America, Frontier, Northeast, Atlantic and Southeast. Click here to see the full map of the Boys' programs of each division. The top three finishers in each division automatically qualify a playoff spot. The remaining 11 spots are considered wildcard positions and the top remaining teams, based on points per game average (PPG), lay claim to those remaining wildcard spots. After the 21 automatic and 11 wildcard teams are determined following the conclusion of regular season play, the teams are then ranked 1-32 based on PPG. After the 32 teams that make the playoffs are established and seeded 1-32 based on PPG, the draw is then able to take place. Using the 1-32 seeds, teams are then sectioned off into four pots: Pot 1 consisting of seeds 1-8, Pot 2 being 9-16, Pot 3 made up of seeds 17-24 and the final 25-32 seeds making up Pot 4. After teams are placed into Pots, the U.S. Soccer Development Academy staff begins the draw by randomly selecting single teams out of Pot 1 and placing them into one of the eight four-team groups (A-H). This process is duplicated for the eight teams in Pot 2, then Pot 3, and finishing with Pot 4. Each group ends up consisting of one team from each of the four pots. The only rule of Academy Playoff Draw is that teams must be re-selected if they are drawn into a group with a team from the same division. The 2018 Boys' Development Academy Playoffs and Knockout Round Quarterfinals will take place in Oceanside, Calif. at the SoCal Sports Complex. The 52.5-acre facility, which houses 22 full-size fields, is a home playing surface to both Boys' and Girls' Academy programs from San Diego Surf. In both the U-16/17 and U-18/19 Boys' Playoffs, the three group stage matchups are dictated by which Pot each team came from. Pot 1 teams are considered the #1 seed in their group, Pot 2 teams are #2 seeds, Pot 3 teams are #3 seeds and each team from Pot 4 is considered the #4 seed in their group. Based on this, the three gamedays are matched up by seed. After the final gamedays are completed (June 22 for U-18/19 and June 23 for U-16/17), the winners of each group stay in Oceanside to compete in a knockout, quarterfinal matchup. Those four games will be determined by overall seed heading into the Academy Playoff Draw: the highest remaining seed still playing will be matched up with the lowest seed remaining, the second highest seed matched up with the second lowest seed, and so forth. All eight teams will have two days of rest between their final group game and the quarterfinal. Winners from the quarterfinals punch their tickets to Kansas City, Kan., where the 2018 Development Academy Championships are set to take place, from July 8-11 at Swope Soccer Village. This year, the Development Academy Championships will take place at Swope Soccer Village in Kansas City, Kan. The event will be held in conjunction with the Girls' Academy Championships, where the inaugural U-15 and U-16/17 Champions will be crowned. The event will also showcase the annual End of Year Awards Banquet, where a multitude of season ending awards will be presented, including Best XI selections and Players of the Year for each playoff-eligible age group's conference. Click here to see all of the award winners from 2017. 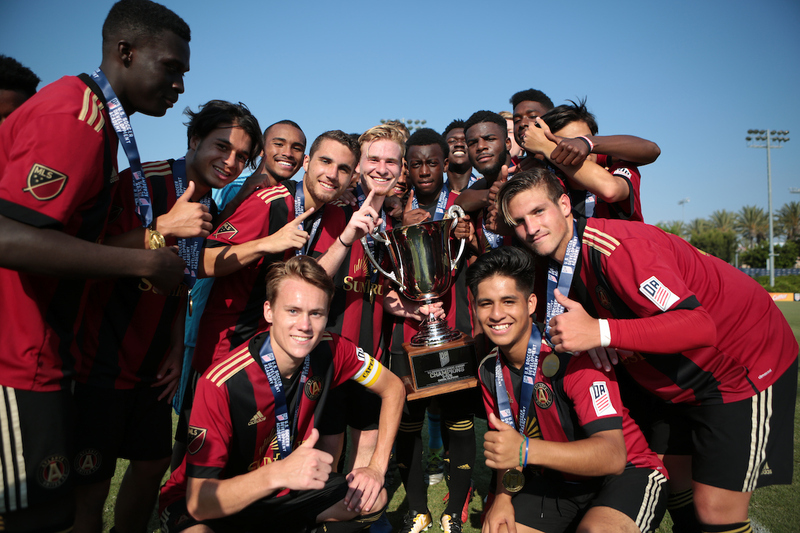 In 2017, at the U.S. Soccer National Development Center in Carson Calif., Atlanta United FC took home the U-15/16 (now U-16/17) Academy Championship by defeating FC Dallas 2-0. The win marked the first time any team has won the Academy Championship in its first year participating in the program since the Academy started in 2007. In the U-17/18 (now U-18/19) age group, Texans SC Houston brought the first Academy Title to Houston after defeating LA Galaxy 2-1, despite a home-field disadvantage.